Browse the collection and choose the suite that best fits your aesthetic vision. After you place your order and submit your wording, a digital proof will be sent to you within 2-4 business days to approve. ONE complimentary round of minor revisions is included with your order. * Any additional rounds of revisions will incur a fee of $50 per invitation piece proof, which will be invoiced to you separately and must be paid before your invitations are sent to press. Please refer to our policies for further details on how this all works. After you give final approval of your proofs, the invitations will be sent to press. After final approval, please allow approximately 3-4 weeks for digital flat printing, 6-7 weeks for letterpress or foil press printing, and an additional 1-2 weeks for envelope addressing and any other add-ons if applicable. Conditions apply. All orders except samples will ship via USPS Priority mail. Not sure how many invitation suites to order? We recommend counting addresses rather than individuals, since invitations are typically mailed to households. Now add 15-20 extra invitations to give yourself room for last minute invites, any you might misplace or damage, and keepsakes to have photographed along with your other day-of details. In most cases, we can accommodate an extra print run, but a $100 set-up fee will be charged. Our standard stock is a 120 lb soft white matte cover stock with a beautiful eggshell finish. It is acid-free, archival, FSC-certified, and manufactured with wind power. Only digital flat printing is available on this paper at this time. Made of 100% cotton fiber, our 110# cotton is tree free and has a soft, textured finish. It comes in soft white and straight-cut edges. Digital flat printing, letterpress, and foil press are available on this paper. 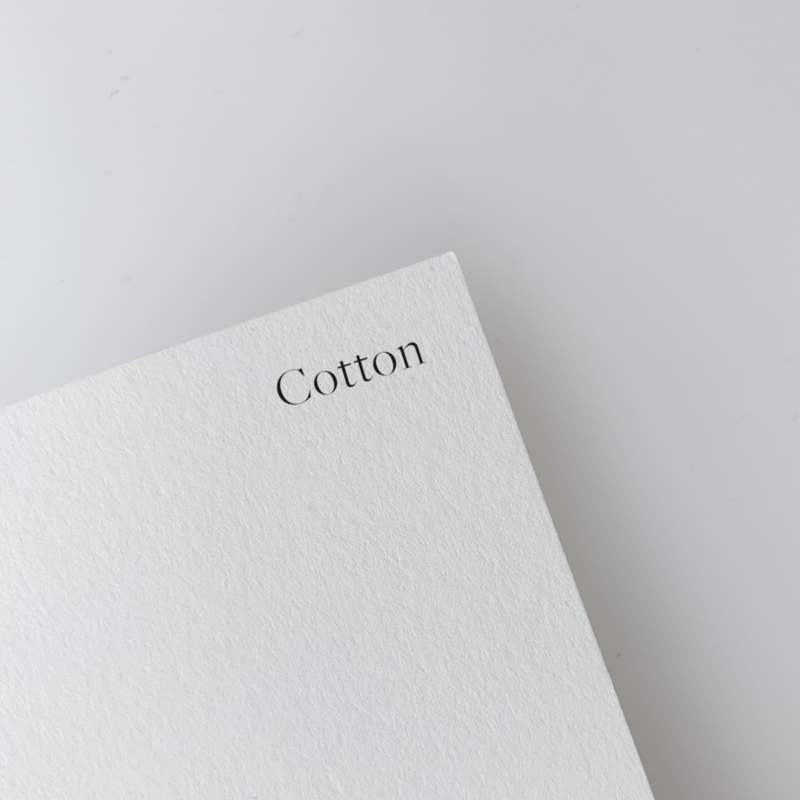 Double the thickness of our 110# cotton with a suppleness that allows for a deep impression of your design when letterpressed onto the surface of the paper. Only letterpress and foil press are available on this paper. Suites printed on card stock will come with euro-flap envelopes. A selection of our suites can be printed on your choice of luxury deckled paper (Arturo or Rossi). Both papers are made in Italy but differ in their look and feel. Digital flat printing, letterpress, and foil press are available on this paper. Arturo paper is a soft white color and has soft, feathery deckled edges on all four sides. 90 lb / 260 gsm with a distinctive "Corona" felt finish. 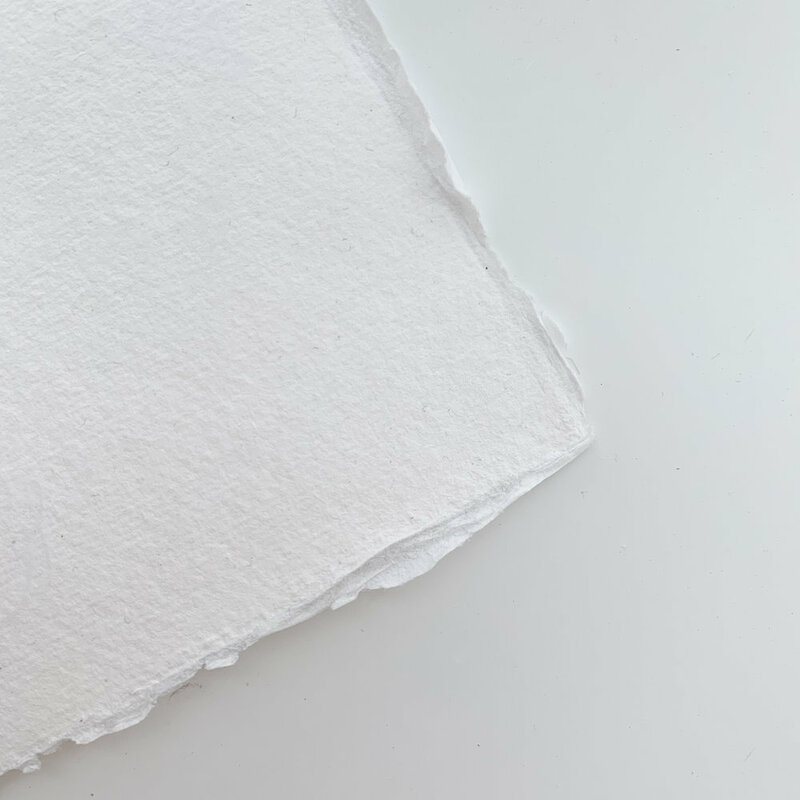 Rossi paper comes in cream and is a stiffer paper with a pebbled finish and a crisp "Amalfi" deckle. The weight is approximately 96 lb / 300 gsm. —Main Invite: 4.5 x 6.75 in. —Outer Envelope: 4.75 x 7 in. —Reply and Details Cards: 3.4 x 5.25 in. —Reply Envelope: 3.5 x 5.5 in. Because our deckled paper is made in Europe, it does not follow US paper sizing standards. For a snug fit, we recommend pairing deckled paper suites with trapezoid flap envelopes (see below), which have been custom made to fit deckled paper. It is still possible to pair your deckled paper suite with pointed flap envelopes, but please note that the envelopes will be roomier. A selection of our suites can be printed handmade paper, our most luxe option. Each sheet of paper is handmade using 100% recycled t-shirt cuttings and comes with naturally deckled edges. Acid and bleach free with a beautiful, highly textured finish. Please note that slight size, paper thickness, print quality, and color variations as well as other imperfections may occur due to the individually handcrafted nature of this paper. If you choose this paper option, we encourage you to embrace these inconsistencies as they give a more organic feel to your invitations! Only letterpress and foil press printing are available on this paper. If you choose to foil press, there may have some breakage due to the handmade, highly textured nature of the paper. We do our best to prep your print so this will not happen, but please be aware there may be some (very slight) patchiness to foil prints. Suites printed on handmade paper will come with euro-flap envelopes. Digital flat printing, letterpress, and foil press printing are available with our suites. Digital flat printing is the most budget-friendly printing option. Your design will be digitally printed on the card, leaving a smooth and flat image on the surface of the paper. Available with our lighter colored 120# card stock and deckled papers. Please note that digital ink will not show up against a dark papers or envelopes. Letterpress printing is a type of relief printing. A custom plate of your design is inked up and pressed into each card, leaving a beautiful debossed impression of your design that you can feel with your fingertips. Available with our 110# cotton, 220# cotton, deckled paper, and handmade paper. Please note that digital ink will not show up against dark papers or envelopes. Similar to letterpress printing, foil press printing is a type of relief printing where the design is pressed into the card. The main difference is that instead of ink, foil is used to print your design. Foil press printing is available on 110# cotton, 220# cotton, deckled paper, and handmade paper, including our darkest papers and envelopes. We strive to represent the colors shown on our website as accurately as possible, but we cannot guarantee that the printed color will look exactly like the screen color. The colors displayed on-screen may vary depending on monitors and what is shown may NOT be an exact representation of what will be printed. To see paper and printing options in person, you can purchase a sample pack. Just follow the link below! All wedding collection designs come with the calligraphy style, typeface, design template, graphic elements, colors, etc as pictured. Customization is available at additional cost. Please inquire separately at hello@ettiekim.com.